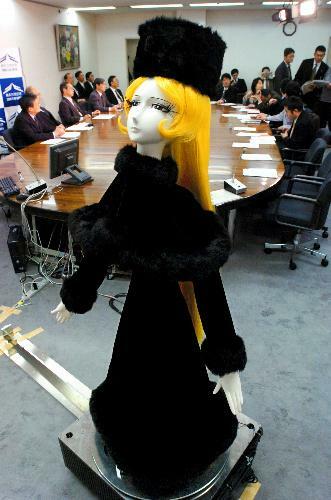 A robot modeled after Maetel, the heroine of Leiji Matusmoto�s legendary Galaxy Express 999 (Gingatetsudo 999) anime, will go to work as a guide at the New Kitakyushu Airport, which is scheduled to open on March 16. The android was unveiled on February 28. The 170 cm (5 ft 7 in) tall Maetel, who was developed by the Kyushu Institute of Technology, will stand duty in the airport terminal�s tourist information center. She is programmed to respond verbally and non-verbally (with gestures) to 200 types of questions about airport facilities, transportation and local accommodations. Leiji Matsumoto, a native of Kitakyushu, says he hopes to see the airport connect Kitakyushu to the rest of the world. However, the airport will provide no international service when it opens. At the moment, Maetel is only able to respond to questions posed in Japanese.